Zappy is an one page super neat app landing template developed with the powerful and latest Bootstrap 4 and Uikit 3 frameworks. 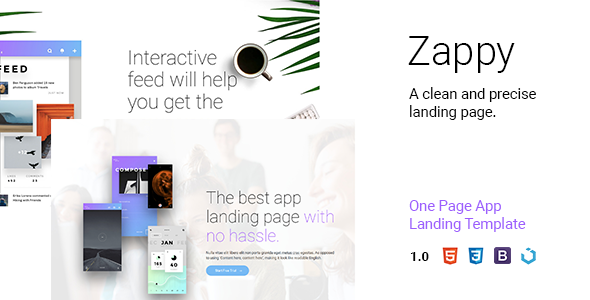 The clean, precise design and snappy functionalities make Zappy a perfect landing page to showcase any of your digital product. Zappy is designed to increase the exposure of your app / digital product by showcasing it in a neat and organized way. The amazing layout of this template will make your customers interested in downloading your app or service. If you’re looking for a template that is easy to use and easy to customize, that looks and feels super organized and will help you showcase your apps in an unique yet simple way, Get Zappy today! RELATE: A clean, simple UI kit for mobile.